Ashbee Design: Have you made the Switch? Mail time used to be a very exciting time for me. I just couldn't wait to get my hands on the catalogs and view all those beautiful ideas. I saved them. No, let's be honest. I hoarded them. I memorized them. I loved them. Times have changed. 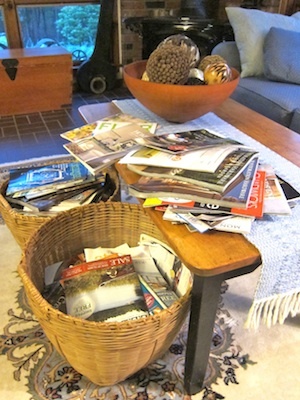 Fewer come by mail by my interest had shifted even before the decline. I still save them but often they go into the storage baskets without my even thumbing through them. Today I decided it was recycling time. Without even sorting out my tried and true favorites I just stacked them into bags and deposited them in the recycle bin in the garage. I don't want you to think I have lost interest though! No it has all been transferred to the web. Most frequently I do my browsing on the iPad through various RSS readers. I am currently switching between Perfect RSS and Reeder. And I just started using Google Catalogs. Are you getting your catalogs online? Any favorite readers or advice for those just making the switch?